FINTECHs are largely start-ups that are in direct competition with traditional financial and banking institutions, and in some respects took them by surprise. Today, FINTECH operates in dozens of countries, and are slowly taken over small chunks of the financial services industry to provide financial products and services that were once only available through large financial institutions. Led by a faculty of technology professionals at the forefront of the industry, this degree fuses technology with business, communication, and management best practices to transform skilled professionals into forward-thinking leaders and innovators ready for the FINTECH revolution. First off let’s understand the technologies behind what powers FINTECH. Artificial intelligence and new sorts of distributed ledgers, including blockchain, are the most important emerging FINTECH technologies. About 30% of large financial organizations are putting money into AI. According to ZDNet.com, 60% of C-level executives in a recent survey conducted by Constellation Research said they will be increasing investment in AI in 2018 by 50% than in previous years. Regarding blockchain, PWC has found that 75% of financial services firms intend to adopt blockchain as part of their in production systems and processes by 2020. But this is the big boys only playing catch up. FINTECH companies have offered AI, blockchain and cryptocurrency solutions to the public for years. 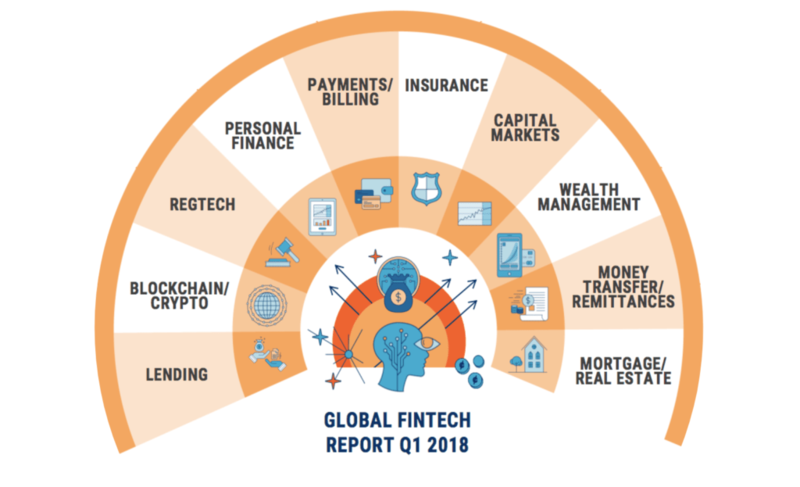 The following chart from CBInsights (Global Fintech Report Q1 2018) is a data-driven look at global financial technology investment trends, top deals, active investors, and corporate activity. Because FINTECH is becoming so popular and part of the financial services industry, there are many tantalizing career options in the field for finance students and professionals to consider. According to Hacknoon.com, requests for block chain programming talent are soaring. According to the freelance talent marketplace Upwork, blockchain rose to one of the fastest growing skills ouf of more than 5000, and there was a year over year increase of more than 35,000%. Visa has reported more than ⅓ of users made a peer to peer digital payment over a mobile device, and ⅗ have sent money to family with a mobile device. There will be a stronger need in future years for financial technology app developers to serve this booming market. A financial analyst is responsible for managing budgets against incoming income forecasts. Depending upon the size of the firm, you could be an analyst for a single division or the entire company. Financial analysts assemble financial reports and do forecasts of incoming revenue, as well as run business studies. See full financial analyst salary outlook. Financial analyst jobs in FINTECH are in great demand as startups continue to grow. Skills are needed in Agile and Scrum, as well as three years of experience as a technical product manager. See full salary outlook for product manager. In fact, the major area in finance that has seen steady job growth since the financial crisis has been in compliance, legal and risk areas, Reuters says. The Wall Street Journal has even wrote that compliance officer is one of the hottest jobs in the country. See 5+ best compliance management degree programs. Online thieves and hackers always go where the money is. Financial services will always be a major target. According to research from IBM’s X-Force research team, the financial services industry has been attacked more than any industry since 2016. But the cyberskills security gap is large and growing. See 5+ best Cybersecurity degree programs. A report by Cybersecurity Ventures recently estimated that cyber crimes will be triple the number of job openings in the next five years. There also will be at least 3.5 million unfilled cybersecurity positions by 2021. Demand is red hot for these workers in FINTECH. ‘Quants’ are the smart people who write the big, complex financial models. They are the ones behind the data-driving trading technology that large investment banks and hedge funds use to trade securities and analyze risk. As big data continues to rise, quants are becoming more important in FINTECH to devise models that can sort through the massive amount of data and automate them so that trading can be a mostly automatic process. See 5+ best quantitative analysis degree programs. The Wall Street Journal recently wrote that the quants now run Wall Street. There are so much in demand that their compensation packages can be as high as $500,000 per year. These math, computing and finance experts are also sought by FINTECH companies; quantum computing is important to develop the algorithms of the future. Keeping talent is so important because hiring the most skilled candidates in the biggest expense of the FINTECH, but also is vital to future development. HR champions and culture evangelists who can build and maintain a diverse workplace will be in great demand. Business development managers are very important in FINTECH organizations because they help to generate new income and help many startup companies to grow. Business development managers look for new markets, new business partnerships, and new ways to tap existing markets. See full salary outlook for business development managers. Deloitte recently highlighted the important strategic role of data in a report with the World Economic Forum about trends affecting the financial services industry. Innovation that emerges will allow financial companies to have access to new sets of data, including social data, and allow new ways to understand markets and customers. See 5+ best data analytics degree programs. As clients are more empowered by the Internet and digital technologies, clients are becoming more proactive and want new financial services companies to give them more individual services tailored to their needs. So, there will be a need for data scientists, chief data officers, financial data analysts and data analytics managers needed to sift through information that can provide more insights into their markets. Java: This programming language is nearly always in job descriptions for investment bankers. It is the programming language that causes headaches for recruiters because there is a shortage of talent. Banks want Java workers to work on order management systems, low latency training programs and more. JP Morgan, Goldman Sachs and UBS all want Java programmers. Business/Finance analyst: Higher demand suggests that banks are thinking in a strategic way about implementing new IT projects. Banks are hiring process change specialists who understand how to do overhauls of back office products and also compliance reporting. C#: The big buzz phrase is ‘building risk weighted asset tools.’ In the risk and analytics team, and possibly partnering with offshore developers C# programmers who can assist banks to devise tools to calculate RWAs are in high demand. Murex: Most jobs that want this knowledge are less about a specialist in the language and more focused on having familiarity with it in a broader list of technical skills. Many consultancies want Murex as an important skill on their strategy teams. Quants also are wanted with this knowledge so they can integrate analytics with Murex. Python: This is a red hot skill for developers in the financial sector. Major banks such as JP Morgan and Bank of America Merril Lynch are employing thousands of developers cranking out Python code. It is becoming a mainstream language for many software products. The trend these days is to bring in Python developers for new interest rate derivatives platforms. FINTECH is a rapidly growing space that most students and professionals will want to learn more about in the future, as so many high-paying jobs are going to be in this sector.